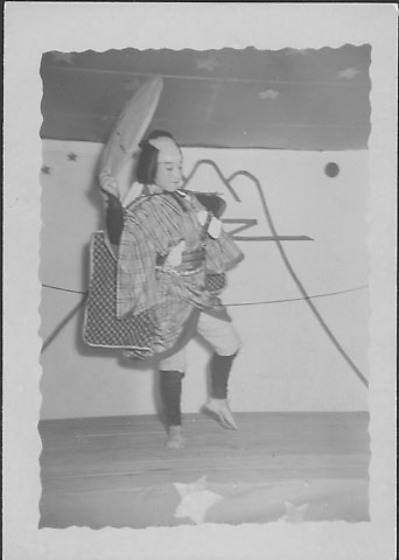 Boy in Japanese costume dancing on stage of Kabuki performance at Rohwer concentration camp, July 3, 1944. Single actor in tartan kimono tucked into obi, shaved head wig, sword and round hat, stands on proper right foot holding up a flat circular hat in proper right hand in front of a stylized mountaintop backdrop. Stars on ceiling and on base of stage. Same boy as in 97.292.4A. Stamped in black ink on back: JUL 4 - 1944 / [blackend out] JUL 6 - 1944.